“We invent these days because we need it, because we aren’t being seen, we aren’t being acknowledged. So we take the power back and we acknowledge ourselves and each other,” Tessa Thompson told BuzzFeed News. From left: Honorees Tessa Thompson, Lena Waithe, Tiffany Haddish, and Danai Gurira onstage during the 2018 Essence Black Women in Hollywood Oscars Luncheon in Beverly Hills. If you, like Issa Rae, were rooting for everyone black this awards season, you only got to celebrate a few moments. At Sunday’s 90th Academy Awards, there was Jordan Peele’s Best Original Screenplay win for Get Out and Kobe Bryant’s Best Short Film (Animated) win for Dear Basketball. (And even that win for Bryant had a problematic shadow cast over it due to the former NBA player’s past.) Earlier this year at the Golden Globes, Sterling K. Brown won for Best Performance by an Actor in a Television Series. And at the Globes and Screen Actors Guild Awards, Oprah Winfrey and Morgan Freeman were given honorary awards respectively. But that’s about it. At the Oscars, some of the nominees included Denzel Washington and Daniel Kaluuya for Best Actor, and Octavia Spencer and Mary J. Blige, both for Best Actress in a Supporting Role. Granted, this was an especially unpredictable year but none of the aforementioned actors prevailed with a golden statue. While Peele made history for winning Best Original Screenplay, he did not win in the coveted Best Director category in which only four black men have been nominated in 90 years — none of whom have won. Mudbound director Dee Rees joined the list of black female directors who didn’t even get nominated in the category despite having her film recognized for Best Adapted Screenplay, Best Cinematography, and Best Supporting Actress (Blige). Tiffany Haddish was overlooked altogether for her hilarious comedic performance in Girls Trip, unlike Melissa McCarthy for her role in Bridesmaids, widely categorized as Girls Trip’s white-counterpart film. And finally, one of 2017’s most successful films, Get Out, failed to win for Best Picture — and this time the envelope was read correctly. But #OscarsSoWhite isn’t anything new, and Black Hollywood no longer waits for their recognition at mainstream award shows. In fact, almost everyone who deserved to be honored for their work this year was celebrated in the week leading up to the Oscars — it just didn’t happen at ceremonies that air live on network television. Instead, it happened in “rooms of requirement” created for us, by us: At annual pre-Oscar awards ceremonies like the American Black Film Festival Honors (ABFF) and Essence’s Black Women in Hollywood Luncheon; intimate dinners like Common’s Toast to the Arts and Alfre Woodard’s Sistahs Soiree; and black excellence parties like the one Jay-Z and Beyoncé threw this year that shook up the post-Oscar party scene that used to have a clear hierarchy. Each of these events look like a powerful sea of melanin, and leave a current so strong every glimpse can’t help but go viral. 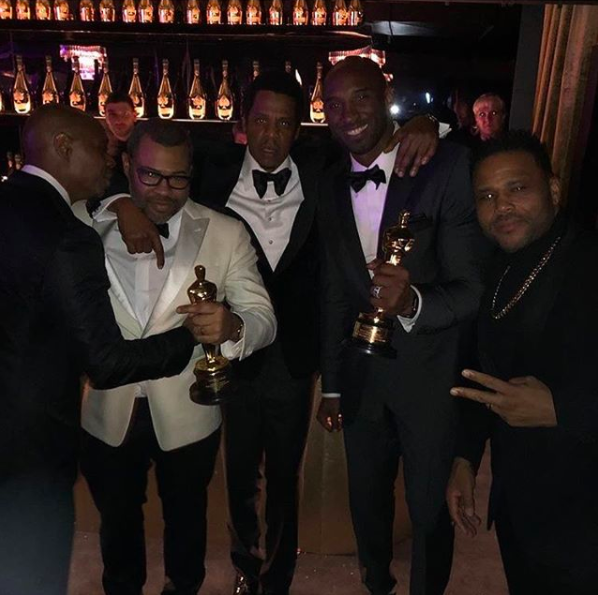 Left: Dave Chappelle, Jordan Peele, Jay-Z, Kobe Bryant, and Anthony Anderson. 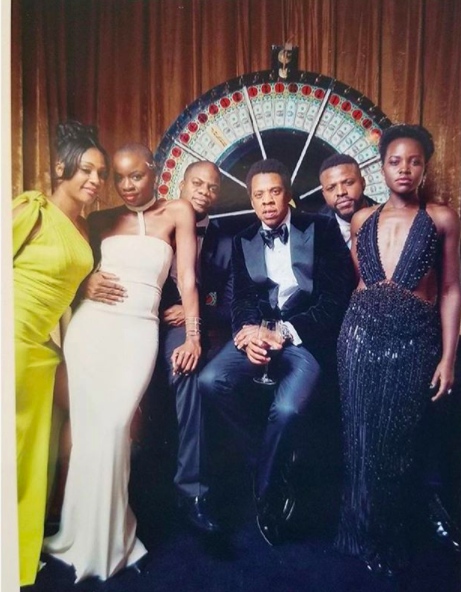 Right: Tiffany Haddish, Danai Gurira, Marcus Henderson, Jay-Z, Winston Duke, and Lupita Nyong'o at Jay-Z and Beyoncé's Oscars afterparty. Thompson was honored at the magazine’s 11th annual luncheon, created to honor black women both in front of and behind the camera in Hollywood. The ceremony, which airs on Oprah Winfrey’s OWN network (notice a trend? ), also honored Black Panther’s Danai Gurira, Girls Trip’s Haddish, and Master of None star and creator of The Chi, Lena Waithe, this year. Held at the Beverly Wilshire hotel in Los Angeles, the event can best be described as a huge black girl magic brunch where all of your Black Hollywood faves (and I do mean all) come together to uplift, celebrate, and fellowship with one another. Many of the women in attendance that day echoed Thompson’s feelings and noted that the luncheon is their favorite awards season event, even more than the Academy Awards itself. Clockwise from left: Susan Kelechi Watson, Yvette Nicole Brown, Lupita Nyong'o, Honoree Lena Waithe, Honoree Tessa Thompson, Sonequa Martin-Green, Edwina Findley Dickerson, and Honoree Danai Gurira attend the 2018 Essence Black Women in Hollywood Oscars Luncheon in Beverly Hills. That subtle change in how Waithe framed her speech demonstrates the difference between these events and the traditional awards season ceremonies. There’s a level of comfort present in the former, a common bond formed through the struggle of being black in Hollywood, and in the case of Essence’s luncheon specifically, a sisterhood that’s formed when a win for one is a win for all. Honoree Danai Gurira (left) and Lupita Nyong'o onstage during the 2018 Essence Black Women in Hollywood Oscars Luncheon. “It’s important for us to remember who we are, and when we look into the eyes of those like us, we remember who we are, we get renewed, we get inspired, we get rejuvenated, we get revived,” Gurira told BuzzFeed News. The Black Panther star went on to explain how many of the women in attendance have broken down barriers and opened doors for future generations of black women in Hollywood to move through. Gurira herself was in the room five years ago watching Oprah Winfrey, Alfre Woodard, Gabrielle Union, Mara Brock-Akil, Naomie Harris, and Quvenzhané Wallis be honored. Since then her star has risen with a hit show (The Walking Dead), No. 1 movie (Black Panther), and a play under her belt (Eclipse). So as she stood onstage accepting her award, presented by another former honoree, Lupita Nyong’o, the newer actors in the room saw that upward mobility in Hollywood is possible for black actors, and that they are not alone in the obstacles they face while trying to achieve it. Lil Rel Howery (left) and Daniel Kaluuya during the 2018 Essence Black Women in Hollywood Oscars Luncheon. The ABFF Honors were held exactly one week before the Oscars, honoring Ava DuVernay, Omari Hardwick, Tiffany Haddish, Billy Dee Williams, and the cast of Martin while also awarding Black-ish, Insecure, Get Out, and Queen Sugar in various traditional categories. It was the only event during awards season where you could see Martin Lawrence and Tisha Campbell-Martin mend their rift onstage, or Issa Rae joke about being too drunk to give a proper acceptance speech, or hear about how Omari Hardwick paid for the craft services while they filmed Middle of Nowhere together because DuVernay couldn’t afford it. Clockwise from left: American Black Film Festival Founder & CEO Jeff Friday, Nicole Friday, Omari Hardwick, Tiffany Haddish, and Billy Dee Williams at the 2018 American Black Film Festival Honors Awards in Beverly Hills, California. Common took his support a step further by creating his own platform to do so, through his Toast to the Arts dinner held in West Hollywood the Friday before the Oscars. There, he honored Rees, Blige, and Charles D. King for Mudbound and filmmaker Charles Burnett. Common and Mary J. Blige attend Toast to the Arts Presented By Remy Martin at Ysabel in West Hollywood, California. Tiffany Haddish (left) and Yvonne Orji attend the 2018 Essence Black Women in Hollywood Oscars Luncheon in Beverly Hills. At one point or another, these FUBU awards ceremonies rooted for everyone black: They recognized the impact black actors, directors, and producers have had in the industry and honored them accordingly; not just with nominations but with actual awards that allowed them a platform to give inspiring speeches and a trophy to take home (or more likely, give to their mama). And they give black actors a place to convene and be in the room since many are often not even invited to awards season’s darling ceremonies, as Gabrielle Union pointed out at the Golden Globes in January when she revealed that was the first time she received an invitation to attend. And when you’re constantly snubbed a seat at the table, it’s only a matter of time before you create your own damn table. That’s what these events are: a space for black artists to be fed both literally and figuratively before they’ve even stepped foot on red carpets; to know that their work mattered whether or not it was recognized by the Academy, the Hollywood Foreign Press, or the rest of the Screen Actors Guild.